British PM David Cameron has compared Russia to Nazi Germany because of its actions in Ukraine on the eve of a tense meeting with Vladimir Putin. 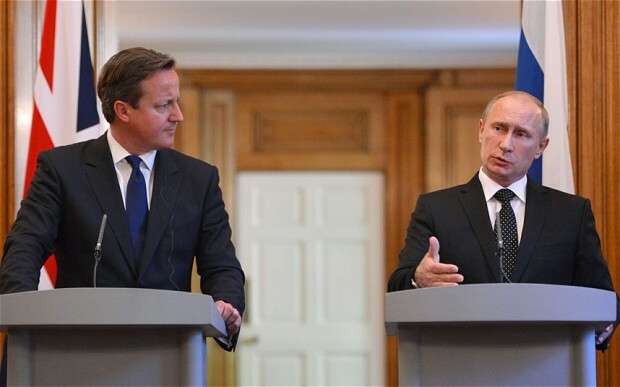 Mr Cameron will on Saturday night challenge Mr Putin about Russia’s continued acts of aggression in Ukraine as it supplies heavy weapons and tanks to the separatists. In a reference to World War II, Mr Cameron said that the world must “learn the lessons of history” and intervene to stop “a larger state bullying a smaller state”. He said: “Russian action in Ukraine is unacceptable. We have to be clear about what we are dealing with. It is a large state bullying a smaller state in Europe. Mr Cameron is expected to meet Mr Putin in an unscheduled “brush-by” on Saturday evening. Speaking in Canberra, Australia, the Prime Minister said he does not believe that there is a “military solution” to the crisis. He instead remains convinced that sanctions against Russia will have an impact. He said: “You can see that with what’s happened to the Rouble, what’s happened to the Russian stock-market. We should use those sanctions in response to Russian action. I would still hope the Russians would see sense and recognise that they should allow Ukraine to develop into an independent and free country. Relations between Mr Putin and western leaders have deteriorated further after Russia stationed warships off the coast of Australia in an apparent “show of force” ahead of the G20 meeting in Brisbane. Earlier, Mr Cameron appeared to criticise Russia in an address to the Australian Parliament, saying the country has adopted an “authoritarian” model of capitalism. He said that democratic values such as the rule of law and a free press make Britain “strong”. He said: “We are democracies. We don’t shy away from self-criticism. “We debate our mistakes in public. That can be painful, but it is so powerful. “Our free and fearless press shines a light wherever it is needed, without fear or favour. “Of course that can make life difficult – but it helps drive out the corruption that destroys so many countries. “Our governments lose cases in court, because we don’t control the courts. “But that’s why people invest in our countries because they have proper rights, and they know that they can get redress from the rule of law and that we have judges who are honest and not on the make. “It is no accident that the most successful countries in the world are those with the absence of conflict or corruption and the presence of strong property rights and institutions.